I took some photos of my backyard beehive and some of my bees in action! I’ve been a backyard beekeeper for two years now and I am fascinated by them and I love their honey. 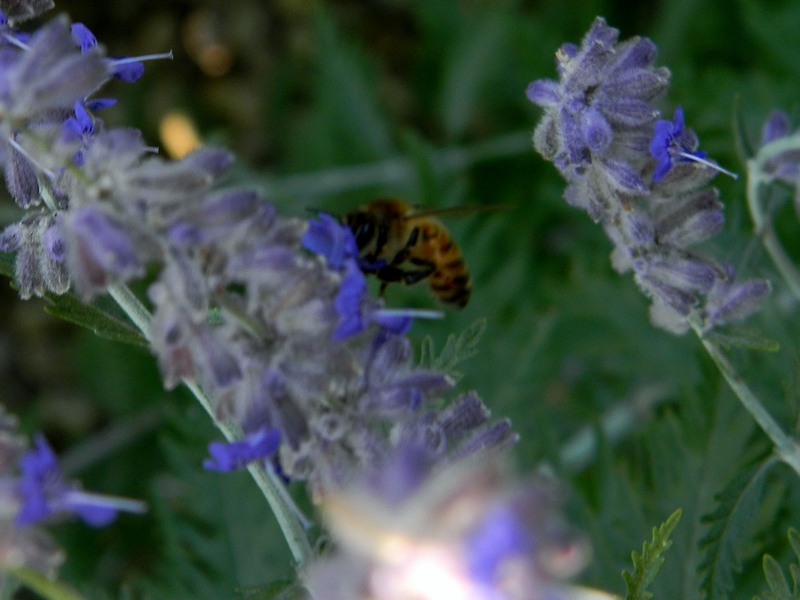 It never ceases to amaze me how they visit thousands and thousands of flowers in their short lifetime and turn those visits into gorgeous wax and sweet honey. As you can see it is not the more popular Langstroth white box hive. That would be too big for my space. 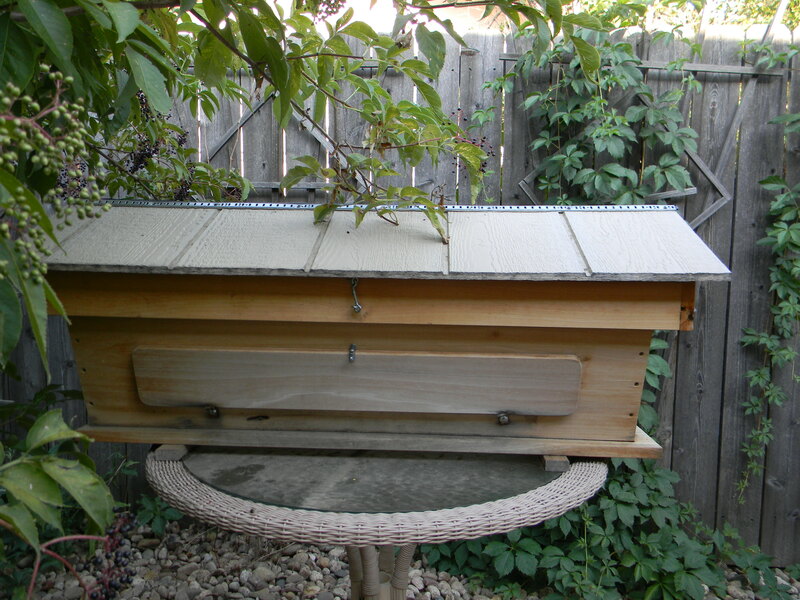 This is a top bar hive that was made locally by a master beekeeper in Boulder, Colorado. The perfect size for my purposes. When you open up the side there is an observation window that runs the length of the hive. It is interesting to sit and watch the serious business of making comb and honey. You can pull up a chair and watch away. The bees don’t bother you if you don’t bother them. Occasionally there will be a nosy nelly who flies close to you out of curiousity but I have yet to be stung while merely observing the hive. This is a close-up looking in the observation window. You can tell the newer comb because it is much lighter in color. 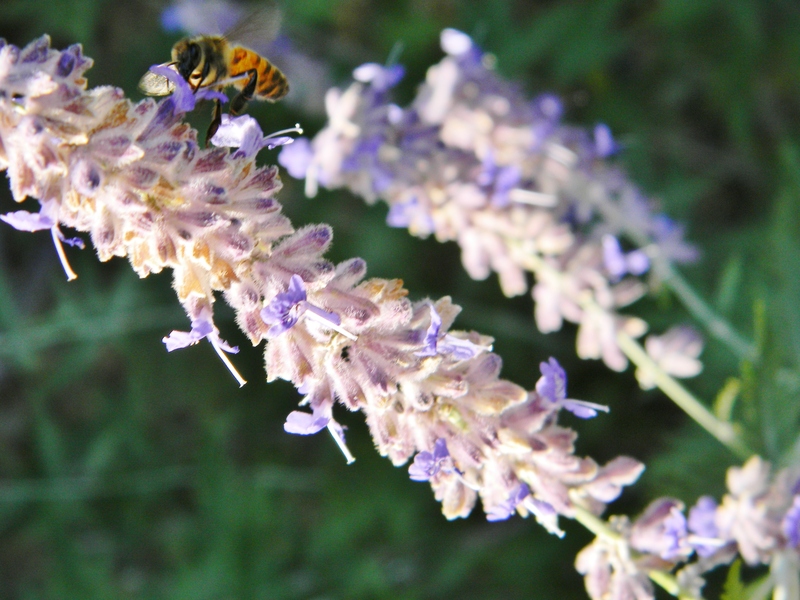 It is estimated that when my hive is full it holds approximately 10,000 bees! 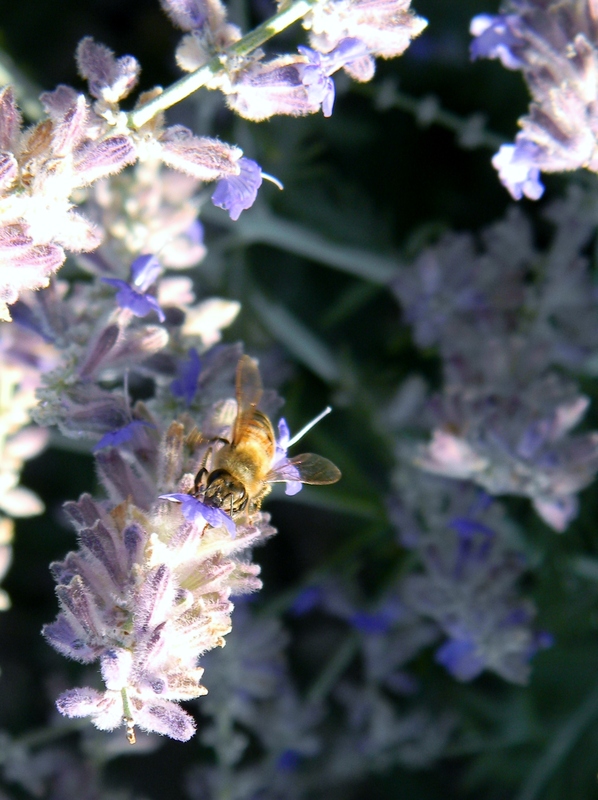 I’ve been working on getting some good pictures of my bees at work. Let me tell you–it is hard to catch the little suckers. They are fast movers when they are pollinating. I pointed my camera in the general direction and hoped I would catch one when I snapped the photo. Here’s a better shot–I love her lacy wings! 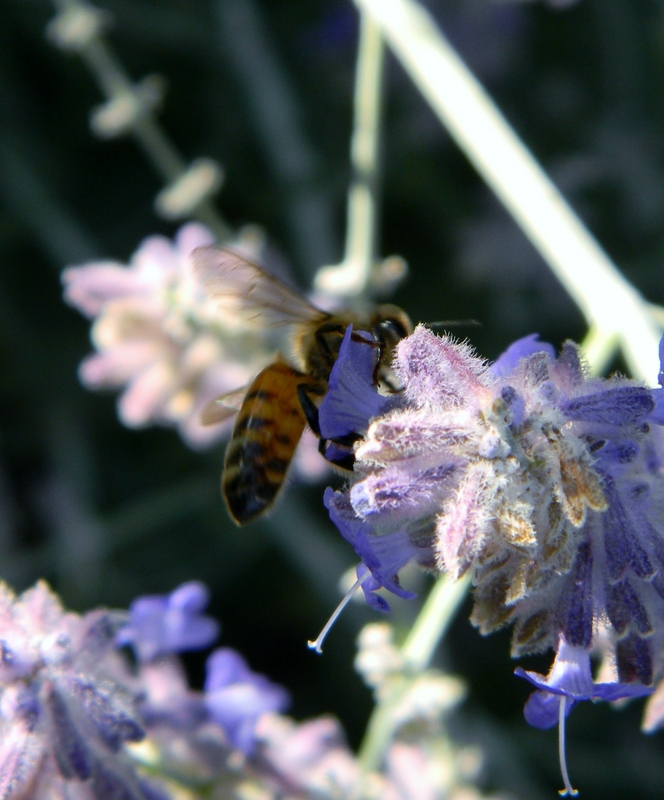 As the bee ages and works her life away her wings become tattered. This one looks pretty good though. When I first got bees I would hear about how attached people would get to their bees. I kinda thought it was a little weird. I had my hive for a season and stole a few combs of honey. My bees wintered over and my swarm survived! Then one of the warmest days of spring I went out to check the hive and every last bee was gone (likely a victim of colony collapse disorder). I was so so sad. I realized then that I had become attached to these wondrous little creatures! I felt like I somehow had a part in making that honey and giving them a good safe place to live. I now understand how beekeepers get attached to their bees. The story does have a happy ending (at least for now)…on Mothers Day this spring my husband called me to the window to see something outside. I was in the middle of something and annoyed to stop and go see whatever but when I looked out the window I SAW BEES buzzing in and out of the hive! Wonder of wonders! A swarm had somehow found my empty hive and was making it home! What a Mothers Day gift from the universe. I will always remember it. I BEElieve in YOU! When I saw the new Bee’s that moved in you hive, I remember saying, ” Patty, you really should come look out this window….. I remember how happy you were! That makes me Happy!